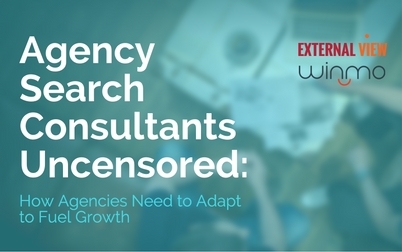 Agency Search Consultants Uncensored: How Agencies Need To Adapt to Fuel Growth from Winmo on Vimeo. In the past year alone, the marketing and advertising landscape has evolved exponentially, which has profoundly impacted the marketing ecosystem and client/agency dynamics. The landscape is becoming increasingly more competitive, where clients work across multiple agencies, marketing spend needs to prove ROI over more channels, and agencies are feeling the pressure to ‘out do’ competitors in creativity, strategy, and pricing. In this complimentary webinar Dave Currie, President of Winmo, sits down with two of the most highly-respected Agency Search Consultants, Russel Wohlwerth and Marianne Ellis of External View Consulting, to address Advertising’s profound industry changes, discuss the evolving roles Agency Search Consultants now play, and reveal what agencies need to do to outshine their competition and win more business. The key issues CMOs are facing- how your agency should adapt to better solve these issues. What capabilities CMOs look for from today’s agencies. Why and how Agency Search Consultants are hired and how they differ from one another. What it takes for a prospective client to say “yes!” to your agency. This webinar caters to agency owners, principals, new business and account executives who are involved in any aspect of business development, managing client relationships or working with procurement departments.